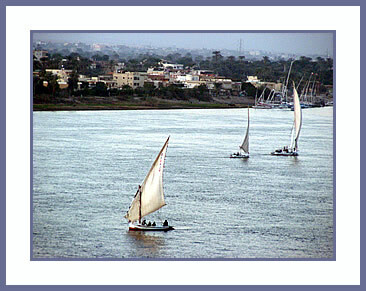 Wouldn’t it be lovely to sail the Nile in a felucca just as the ancients did? Looking over the wide Nile river from our rooms shown in What is Luxury?, I took a zoom lens picture of these feluccas, seen all during our trip down the Nile. Many of the boats are used for transporting goods, but on this particular day it seemed that everyone was there for pleasure. A few days earlier we, ourselves, had taken a ride on this ancient form of transportation, which was manned by Nubians, a desert group of dark-skinned people who are beginning to hold more responsible positions in society than they had for centuries. The felucca rarely has an engine and relies on the breeze to carry tourists who want to enjoy the currents of the river. I understand that few are now made of wood, but the basic layout has barely changed. They don’t have a keel as such, but a heavy center plate can be raised in the shallows. The sails are made of native cotton (of which Egyptians are justifiably proud) and other fibers.